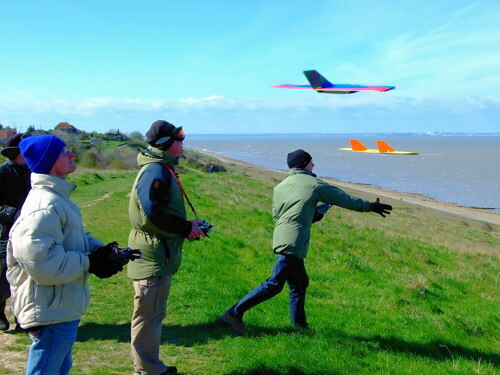 Here's information on radio control slope soaring sites (model glider flying slopes). This page lists slopes beginning with K to M. Download the pdf from the Home page if you want this information in a prettier format with more photographs. Kemsing Down and neighbouring St Clere Down are a few miles outside the M25 in Kent - two of the closer slopes to London. 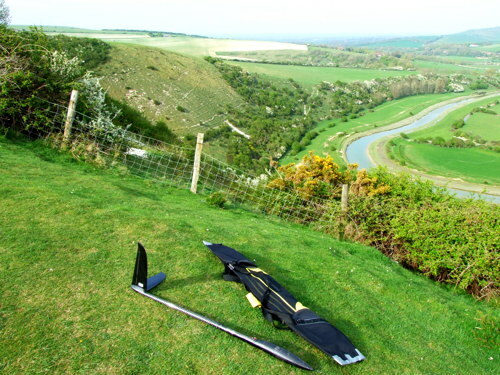 Model gliders have been flown on half a dozen slopes around the Otford area of Kent since the 1950s. However these slopes seldom seem to get used these days, perhaps because they are rather small compared to the slopes of the South Downs. They’re more suited to delicate balsa-and-tissue floaters, or modern equivalents such as Alulas, than modern big air machines. Nevertheless, two hills in the area offer significant slopes: Kemsing Down and St Clere Down. Kemsing Down is a large, exposed, grass-covered slope of medium steepness. It faces precisely south and overlooks the small village of Kemsing, outside the M25 to the southeast of London. It is public access land owned by the local council. It works best in south winds, although SSE through to SSW winds also work well. It is quite high - almost 100 metres - and the unobstructed grassy slope is the best part of a mile wide. So landing is not a problem, at least for planes that do not require a level landing area. However trees at the base of the slope can reduce the lift and add a dash of turbulence. A couple of miles to the east is St Clere Down, a good but often deserted slope. It faces south like Kemsing and overlooks the little village of St Clere. The lift is pleasantly smooth, although the slope's gradient is shallow so the lift is not huge. 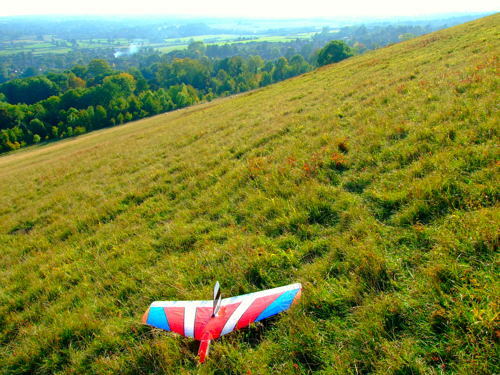 The slope is private land - the St Clere Estate - and to fly there you must be a member of the Invicta Model Flyers Club. This is enforced by a shotgun-toting gamekeeper! The fees are fairly modest so it is worth joining if you live in the area. St Clere Down is closed from September to February (to allow pheasant to breed, apparently). The slope is often known by the name of Wrotham (pronounced "Roo Tim!"). A couple of miles to the west, nearer the M25, are several small slopes around Otford. Otford Mount has two modest slopes, one facing west (visible from the road that leads from Otford to Shoreham) and one facing south (overlooking Otford). Polhill Bank is a small slope on the other side of the valley facing SSE. The slopes are too small for major lift but are pleasant locations for flying small, light planes. Kemsing Down is worth 5 - not a premier league slope but not too shabby all the same. St Clere Down is worth the same amount, but remember you need to join the club to fly there. Polhill Bank and Otford Mount are really just handy spots for locals. The village of Otford is close to the M25, but the problem is that there are no junctions near it, so you’ll have to take a slightly convoluted route from junction 4 or 5. Once you're in Otford, go east onto Pilgrims Way East, signposted Kemsing. Note your mileage reading as you enter Pilgrims Way East and continue along the road as it gets narrower for exactly 1.6 miles. On your left you'll spot a metal gate with a little sign saying Kemsing Down Nature Reserve. If you have a small car you can probably park on the side of the road, but the road is so narrow that you may struggle to park a large car here. In fact the lack of parking is Kemsing's major limiting factor. Once you have scored a parking space, walk through the gate. You'll be quite startled by the size of the slope immediately in front of you since it is virtually invisible from the road. It's a bit of a hard hike to the top, but at least there's a bench halfway up. St Clere Down is eastwards from Kemsing Down along the same road. It can also be accessed from Junction 2 of the M26, through the village of Wrotham. Park on Exedown Road, display your membership dashboard card, go through the gate and walk forwards a hundred yards. Otford Mount is just north of Otford village and is accessed from the road that runs north to Shoreham. A path leads from the road to the slopes but it is not easy to spot from the road. It is just south of an isolated building that was once a telephone exchange. Polhill Bank is just outside the M25 but it is accessed from inside the M25. If you’re on the M25, exit at junction 4 and drive towards London for half a mile. At the roundabout take the A224 south for about one and a half miles until you see a pub on your left called the Polhill Arms (which now seems to be boarded up). Park and take the path (bridleway) that starts behind the pub carpark. This diverges left and right. Take the left branch and after 100 yards cross the footbridge over the M25. Polhill Bank is a 5 minute walk through the woods and to your right. A few miles northwest of Eastbourne in East Sussex. There are several slopes here. 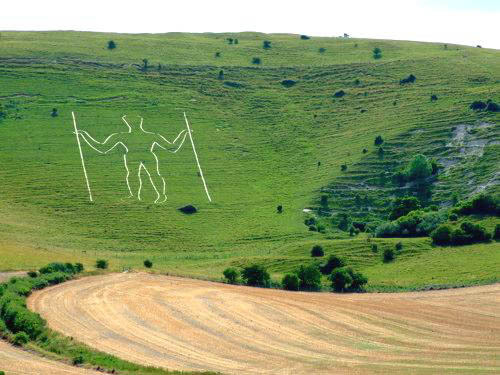 The slope that can be seen most clearly from the road - the one with the Long Man on it - is a very large bowl with superb lift. It works in a range of northerly winds. It faces mainly north, although around the bowl it varies from NNE to northwest. In fact it is often referred to as a northwest slope. There is also a good southwest bowl which has a flyable west-facing flank. This bowl funnels the wind so you’ll often find the wind is stronger than forecast. The landing area is the wide but shallow strip along the top of the bowl. Take care not to fly low and slow over the sunken track behind this landing area, because there can be weird turbulence there. One landing option is to come in sideways and turn into the wind in the last few seconds. For a really safe landing option, it is possible to walk up to the peak of the hill (to your left) and land on the nice flat area up there. The ascent from the carpark will seem like a refreshing spot of exercise or a real chore depending on the size of your beer belly! The walk is about 20 minutes if you start at the main carpark. From the slope soarers’ carpark (see below) the walk takes 10-15 minutes. 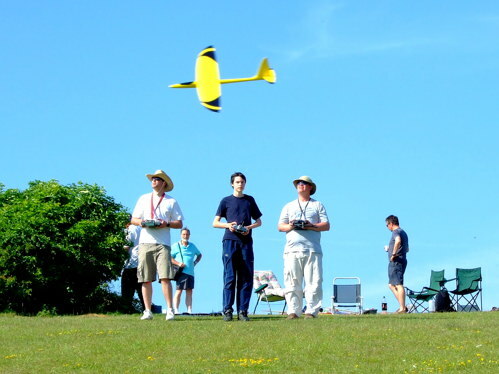 A friendly club often flies at Long Man and is well worth joining: eastsussexsa.co.uk. BMFA insurance is required to fly at Long Man. This is because the southeast section of the BMFA pays a fee for use of the site, which is managed by an archaeological society (due the presence of the Long Man). Of course it's smart to have BMFA insurance irrespective of where you fly. The slopes merit 8 but if you’re unfit you'll want to knock off a point for the climb! If you’re starting from London, drive down the M23 to the A27. Drive east along the A27 to the Wilmington exit (you will see the brown Long Man sign – it’s a couple of miles before the Eastbourne exit). Turn down this road. A little under a mile past the pretty village of Wilmington is a small carpark on the right that is used by flyers in the know. This offers a shorter walk to the peak than does the main carpark in Wilmington. Across the road from this slope soarers’ carpark is a gate to a public path. Up this path the southwest bowl is reached first, on your right. Just past that is the northwest bowl – Long Man’s biggest slope – on your left. A couple of miles southwest of Long Man Hill is another reasonably good spot, Hindover Hill. This is a very steep bowl that faces east. To the right of the wooded area is an east face (maybe a bit ENE) and to the left is a southeast face. The lift can be strong but turbulent. The landing areas at the top of the slopes are small, although it is possible to fly down and land in fields. When the wind is less than about 10-12mph Hindover Hill is popular with paragliders, so it would be wise to fly here only when the wind is strong. The site is best known by its nickname: High and Over. 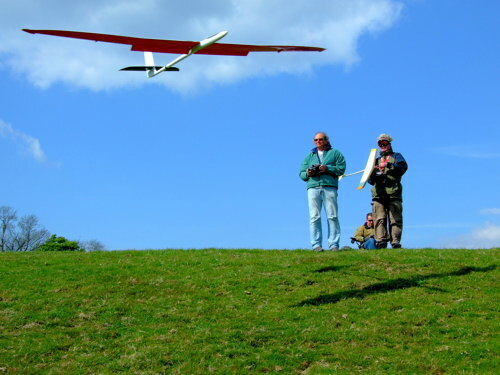 Alert: in April 2015 a full size aeroplane struck a model glider at Mill Hill. Luckily no one was hurt. An investigation found that the model glider flyer was not at fault. 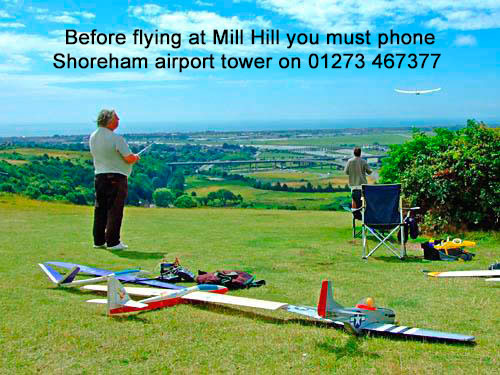 However, the incident emphasises the importance of following the rules at Mill Hill and not flying models too high. Near Shoreham-by-Sea in West Sussex, half a dozen miles from the south coast. It's nowhere near Mill Hill in north London - only very confused slope soarers go there. Mill Hill is one of the best known slopes in West Sussex and people come from miles around to soar it. It overlooks Shoreham airport and the sea beyond. The hill is large and relatively unobstructed. The slope faces southwest. Southwesterlies are common in this area so it is amazing how often Mill Hill is flyable. The slope works for winds from SSW around to west (wind directly from the south doesn't seem to work well). The lift is good and can be very strong in the right conditions. Perhaps it can be a little turbulent at times. The gradient is moderately steep lower down but quite shallow towards the landing area. There are some awfully prickly bushes down there, so try not to land out if you are wearing shorts! The landing area is not large, but it is relatively trouble-free and devoid of obstructions. However if you go too far back you will almost certainly get sucked down onto the wrong side of the road. Too many planes have come to grief there - so just stay over the landing area, and never, ever allow your plane to stray further back. There are height restrictions at Mill Hill. No, that does not mean your kids can't accompany you - it means models must not fly higher than 50 feet above the peak of the hill. This is due to the slope’s proximity to the airport. It is obviously essential that models stay well below the light aircraft that pass overhead frequently as they approach the runway. Apparently Air Traffic Control may allow models to fly higher if you phone them first on 01273 467377. The hill looks like it would merit a 6, but there's something about this site - mainly the reliability of the wind and the friendliness of the flyers - that makes it a 7. Mill Hill is featured in the flight simulator 'Reflex XTR' as a photo-realistic site, so you could fly there without actually driving there. If you insist on the real thing, you can get to Mill Hill from London by driving down the A24 or M23. The M23 might be quicker. After the M23 becomes the A23, when you get to the A27 junction, get into the left lane to head west towards Worthing. When you reach the A283, turn left towards Shoreham and take the first left (at the Amsterdam pub). After half a mile take the left signposted Mill Hill (Erringham Road). Go straight, following the Mill Hill signs, and park on the left in the Mill Hill Local Nature Reserve carpark. The slope is right there, just ten yards from the carpark. Slopes don't come much more convenient than that! The area is public access land owned by the local council. If you get the urge for some radio control retail therapy, one of the country’s largest retailers, Sussex Model Centre, is not far away in Worthing. The cliffs at Minster are on the north shore of the Isle of Sheppey in Kent. The island also offers two other flying spots on its east shore at Warden. The Minster cliffs are modest yet nicely flyable in north to northeast winds. The cliffs face NNE and this is the ideal wind direction to fly in. The lift is not big enough for heavy models, but the ultra-smooth sea air makes flying light models a pleasure. The landing area is small so foamies are a good choice. About four miles east of Minster Cliffs are two spots, Warden Point and Warden Springs. The spot that has been used for years, Warden Point, is getting smaller due to coastal erosion. The landing zone is now extremely restricted. However, it is unique in working in east wind. Warden Springs is a few hundred yards to the north. It is a more recently discovered site that faces northeast. It has better lift - possibly the best on the island. Minster Cliffs scores 5, as does Warden Springs. Warden Point is now probably only a 4. None of these are huge spots, but the flying can be excellent with the right model in the right conditions. To get to Minster Cliffs, head eastwards from London and go up the A249 and over the bridge onto the Isle of Sheppey. Follow the signs into Minster. Some flyers park in the free carpark at the end of Seathorpe Avenue and walk a hundred yards eastwards. To get to Warden Springs, go to Eastchurch and follow Warden Road to the coast. The flying area is just to the right of the road. To get to Warden Point, walk from Warden Springs, or drive around to Warden Bay and go up Cliff Drive until it becomes a gravel track. Park a few yards up the track (ensuring you don't block access of course) and you'll see the cliffs to your right. These three areas are owned by the local council. Take great care not to land in the private gardens behind the public paths. The Bartons Point Model Flying Club sometimes flies at these sites and is well worth joining if you live in the area. About ten miles east of Brighton on the A27. Mount Caburn is hard to miss if you drive along this stretch of the A27. It is a large, bare, conical hill which is often teeming with paragliders. 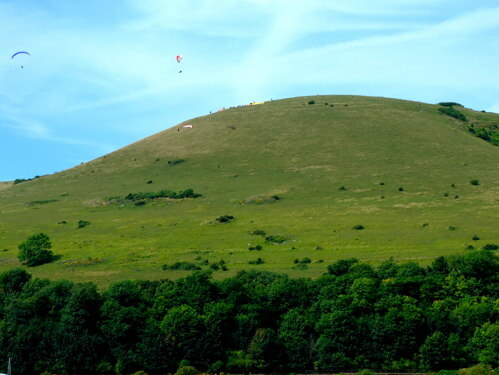 Due to this popularity, it is recommended that Mount Caburn should only used by model glider flyers when the wind is too strong for paragliders. Mount Caburn is a National Nature Reserve managed by Natural England on behalf of the landowner, the Glynde Estate. The land is grazed by a tenant farmer. The hill works in south wind. 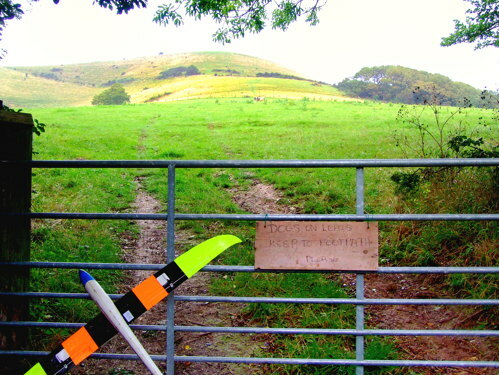 Mount Caburn is not a particularly popular radio control flying site and there are often no model gliders even when conditions are good. A paragliding school operates from the hill. It is requested that model flyers respect this and stay away when the wind is low enough for paragliders (besides, the hill is not much good for model gliders when the wind is low). 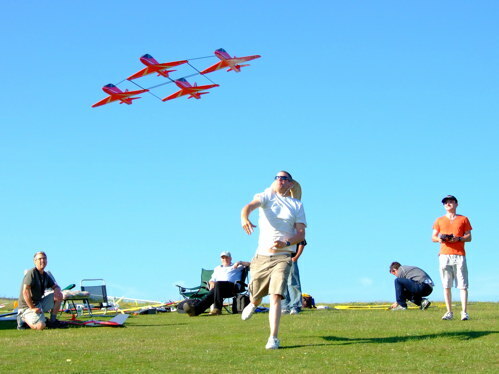 When the wind is over about 12mph, model glider flyers usually have the hill to themselves. Should any paragliders appear, obviously right of way must always be given to them. 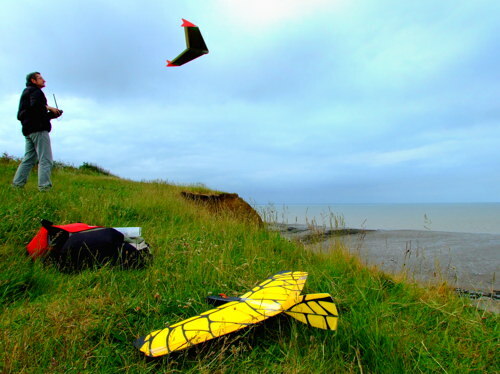 The British Hang-Gliding and Paragliding Association provides very sensible advice on this matter: BHPA Policy. Flying at Mount Caburn involves a climb to the peak. There are four or five possible routes. The easiest route is from the village of Glynde behind the slope. That climb is less steep than the others. There is a 'hard man route' up the front of the slope, but it is a tough climb and should not be attempted by anyone with doubtful cardiovascular fitness. Mount Caburn scores 5. Without the climb and the paragliders it might be worth 6. From the M23 head east on the A27. A couple of miles after Lewes you will see Mount Caburn on your left. Take the exit marked Glynde, half a mile after you pass Mount Caburn (the exit is the first road to your left after the Beddingham roundabout). Drive for half a mile through Glynde and just after you pass Glynde Place on your right you’ll find the entrance to the easiest path to the summit on your left. If you prefer to take the hard man route to the top, turn left into Ranscombe Lane a few hundred yards before the easiest path. Drive until you’re in front of the slope, quite close to the A27, and the entrance gate is on your right. Take a moment to park considerately because the locals get annoyed by city types abandoning vanity four wheel drives all over the lane. Go through the metal gate and cross the field. Give the bull a wide berth, if he’s in the field, and head for the red ribbon that marks the location of the stile leading to the path up to the summit. There is information on Mount Caburn National Nature Reserve on this website: Natural England. 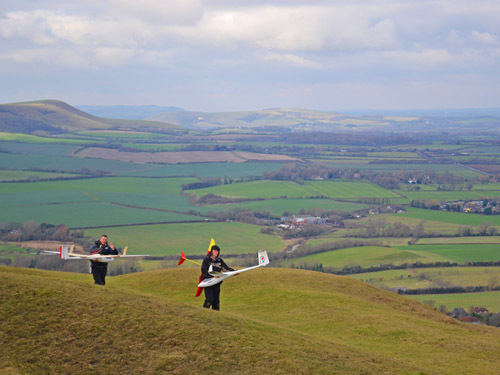 The information leaflet is worth downloading because it describes the fascinating history of Mount Caburn and features model flying on page 24. Across the road from Mount Caburn can be seen various northeast slopes such as Kingston Castle Hill, which is a very good bowl that is accessible only by hiking. Further details on Kingston Castle Hill are given in the Ditchling Beacon listing.